Kate The Bake: dim sum, gluten free, yum! Another snack to share, this time from the far east. 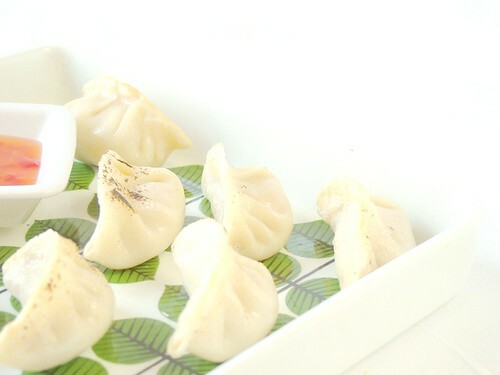 There is plenty of inspiration for gluten free eaters in the whole of Asia but I have missed some of those dimsum classics made with wheat wrappers, so here is a recipe for gluten-free chinese pot sticker dumplings. Inspired by a lovely photo taken by a fellow food blogger Matt over at Foodforfriendsyeah, I adapted the recipe for the pot stickers from a great recipe and guide by Kate at Glutenfreegobsmacked. I was so excited by the prospect of making elastic gluten free wrappers, I didn't shop for the filling for either of the recipes above however they came out really tasty (phew!). I suggest making this dough by hand rather than a mixer as it seems to respond well to gentle handling. It is definitely one of those recipes that calls for many pairs of hands ( and probably a bottle of wine to share) to make them quickly. * Apologies for the recipe being in cups, I will add the metric measurements next time I make them. Blitz this all together in a food processor until it forms a paste. Chill until the wrappers are ready to be filled. Sieve all the dry ingredients together. In this recipe I have subsistuted the suggested gelatine in the source recipe for a 50/50 mix of kuzu and psyillium husks. I only have gelatine in sheets so couldn't make an adequate substitution for the 1tsp required in the recipe. Luckily the kuzu and psyllium seem to work well to make a moist and flexible wrapper that doesn't crack or dry out too quickly. Beat the egg into the cold water. Whilst stirring your flour, gradually pour in the water making sure the flour absorbs the water as you go. Bring the lumps of flour together in the bowl by hand. If the dough is too wet or sticky add more sweet rice flour, if it is too dry add water 1 tablespoon at a time. By some fluke the liquid levels were spot on for me and the dough quickly formed a smooth and elastic mass. I kneaded this for a couple of minutes on a work surfaced sprinkled with a little corn starch - mostly because it is so nice to be able to knead a gluten free dough, I don't know if it was strictly necessary! Divide the dough into 4 or 5 equal pieces. Leave all but 1 piece in a bowl under a damp tea towel. Dust your work surface with corn starch and roll out the small piece of dough until it is between 1/16th" & 1/8th" thick. Using a 3-3.5 inch round cutter, cut out as many shapes as you can. put the circles to one side under a damp cloth and carry on with each piece of dough in turn. I found that if you collected up the trimmings and sprinkled a couple of drops of water on them, you could combine them into the next piece of dough without any problems. Carry on until all the pot stickers are cut out. Now take your made filling and place a teaspoon full in the middle of each wrapper. Fold the dough over the filling and pinch the 2 sides of the wrapper together to seal the dumpling. Now you need to niftly create 3 folds in the dough and seal each side tight together. There is an excellent instruction on how to do this by Jen at userealbutter here with pics too, which is far better than I can provide! Carry on making the dumplings until you have used up all your mixes. Boil a large pan of water (I added 1/2 tsp salt to the water). When the water is boiling add some dumplings, enough to create a layer on the bottom of the pan. Leave the dumplings to boil for 6 minutes, they will float to the surface as they cook but do leave them the full time as, unlikely gnocchi, the wrapper won't be cooked when they first float to the surface. Heat some rapeseed oil in a non-stick frying pan. Drain the potstickers and transfer them to the frying pan for a few minutes until they are lightly browned and crispy. Whilst this batch are fyring booil the next batch, continue until all the pot stickers are cooked. You can freeze the potsticker dumplings uncooked. If you do they will need between 12-20 minutes to boil from frozen. I hope you like these - do let me know how you get on with the recipe and any different recipes for fillings that you may use. Kate, good work on these! I'm impressed you managed to come up with a gluten free alternative, and also that your pics are really good. Looks like you're really getting into your white boards and lighting etc! I'm going to follow the link to see how to properly wrap the dumplings, as yours look amazing! The first time I made them I actually boiled, then fried, as you did. The results were really good, but when I discovered you could do it all in one pan, I had to try it. That's when I discovered why they're called potstickers, as they really stick to the pan. Your way of cooking them gets around this, so is a good idea if you don't have a decent non stick pan! I was really suprised at how well they turned out. The gluten free version doesn't seem to be as sticky as the wheat recipe. I think this makes it easier to handle. As the wrapped is firmer, you can boil them for longer to get a softer dumpling, or cook them in a stock and make them soup dumplings instead. Thank you so much for sharing such a wonderful recipe. I made them last night. The dough was stretchy and easy to work with. I rolled it so as thin as 1/16” and it didn’t fall apart. One question I want to ask; after I steamed them for about 15 minutes and let it coll the skin was tuff (not harden). Is this supposed to be? I don’t remember how the wheat version of steamed pot sticker’s skins supposes to be.